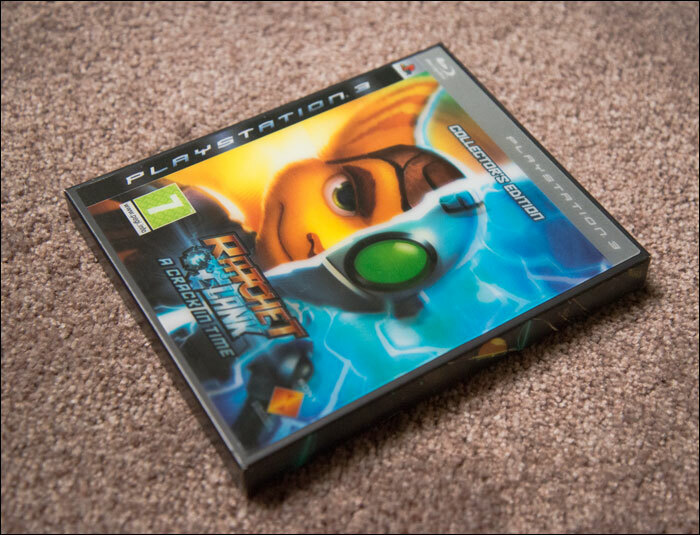 Ratchet & Clank: A Crack in Time was released in 2009, exclusively for PlayStation 3. 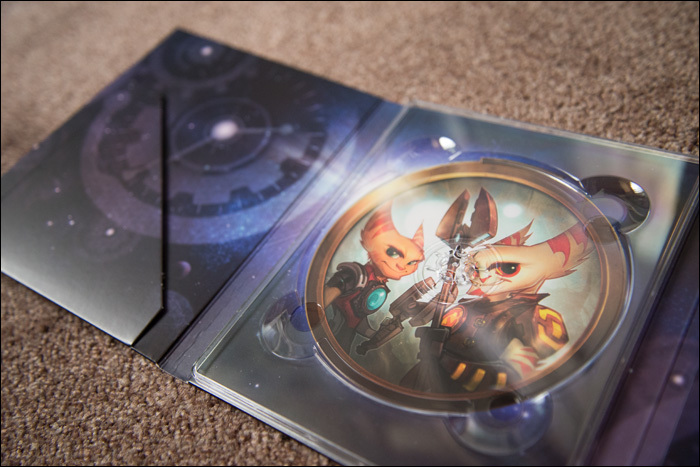 This collector’s edition, which was exclusive for the PAL regions, comes in a fold-out paper box with a dust cover. 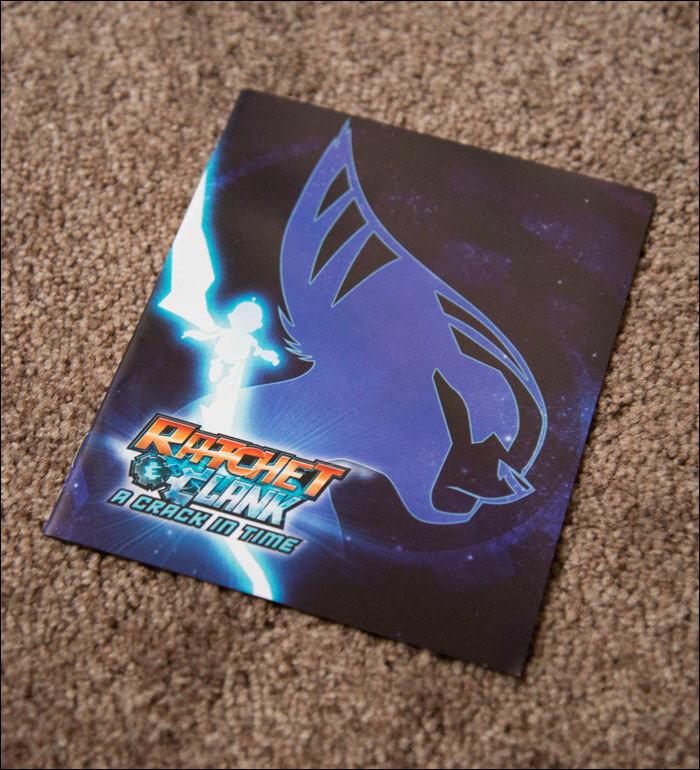 The outer sleeve of the box features a lenticular print on the front, showing a split close up of half of Ratchet’s and half of Clank’s face. We’re not a big fan of this cover, frontal close ups of a determined protagonist facing the camera aren’t exactly original. Also, the split close-up causes a lack of balance in the image, as the symmetry is lost (after all, Ratchet has large ears, while Clank doesn’t). We just think they could’ve done more with it. The lenticular 3D effect is nice, though it’s hard to focus on. The inside of the box looks a lot better, showing a piece of artwork of the Great Clock, wrapped all around the box. If you ask us, this artwork should have been on the front. 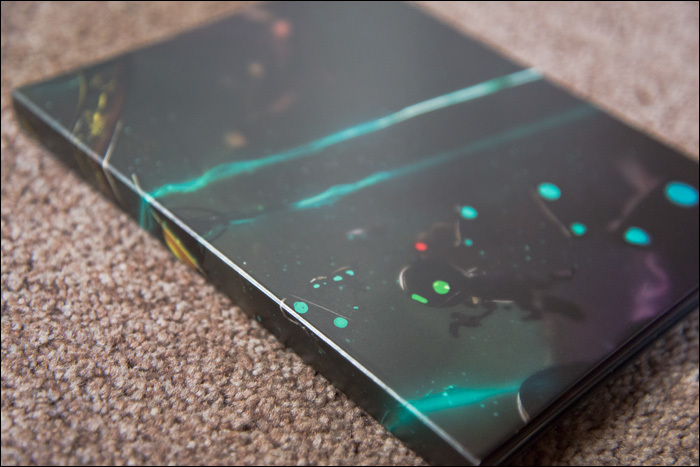 This case looks really nice, and is definitely the most impressive thing about this edition. 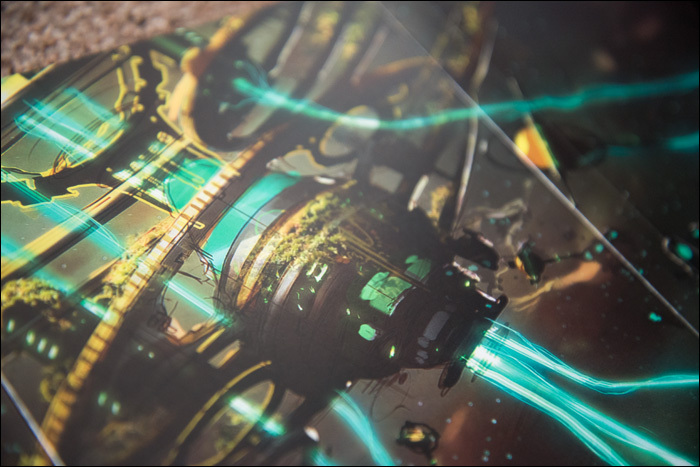 Behind the disc is the same artwork that is on Alister Azimuth’s watch in the game. 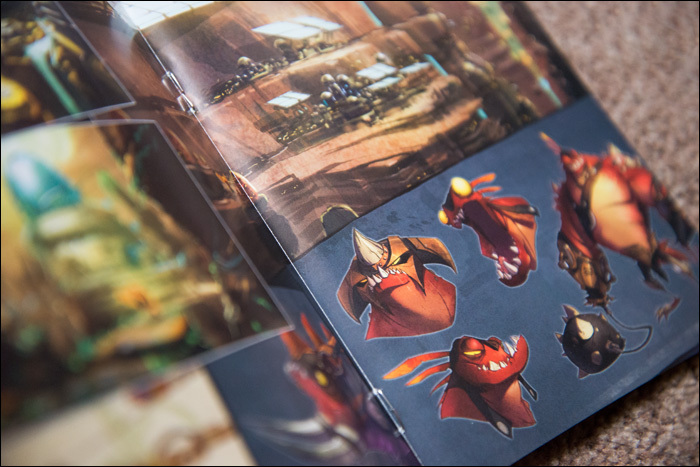 It also comes with a small, ten page art book. Nothing too impressive, but a nice little extra. A digital bonus is included as well: the Insomniac Moon. This is a museum displaying things that didn’t make it into the game. In conclusion, we like this collector’s edition. 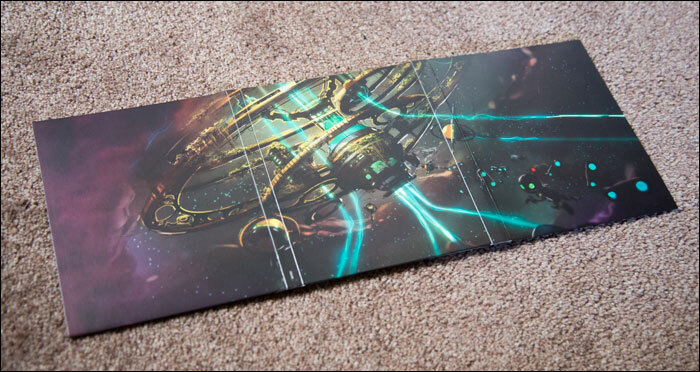 The outer sleeve’s artwork isn’t something we’re a big fan of, but the inner case looks beautiful. The main problem is how fragile these kind of paper boxes are, we had to return the game two times before we received one that wasn’t completely squashed. But we’re glad to have it now. The main selling point here is clearly the presentation and not the contents, but that’s not a problem for us. 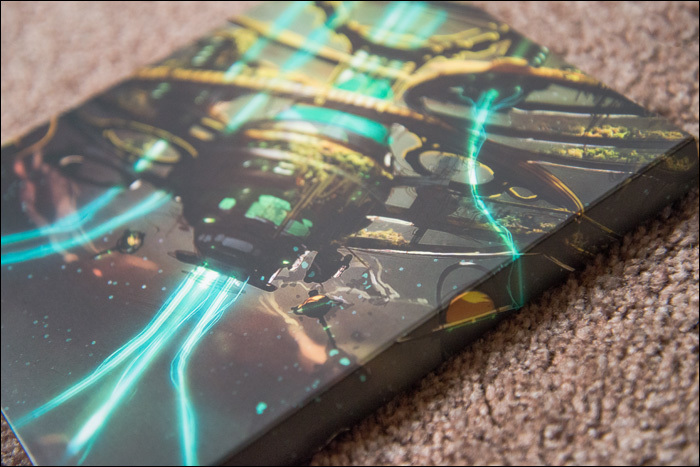 A nice collector’s item for any Ratchet & Clank fan to own.